Progress, and it feels pretty good. 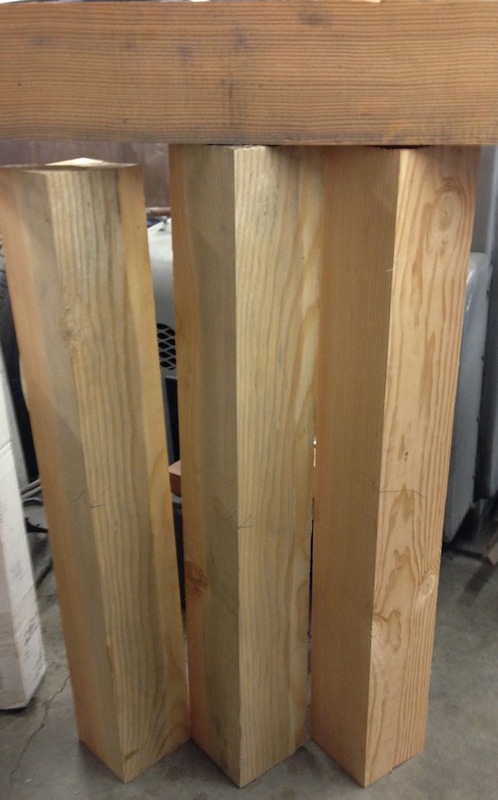 I got all four of the legs for my Rouboish workbench trued up on four sides this weekend. What a workout. 1. Flatten one face, checking it for flatness with a straightedge and using winding sticks to check for twist. Mark this face with a loop. 2. Repeat the process with one adjacent face, also checking that it’s 90 degrees (square) to the first face. Typically this is an edge, but my stock is square so there you go. Mark this with a “V” pointing to the first reference face. 3. 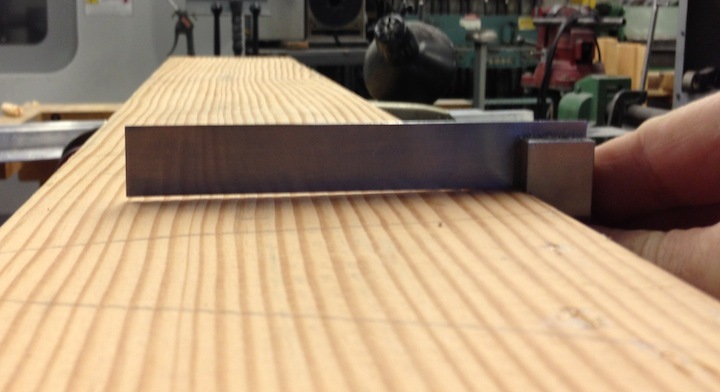 Use a gauge to scribe a line parallel to one of the reference faces all around the stock for the thickness. The gauge rides on one of your reference surfaces. Plane down to the line and check for flat and twist. 4. Repeat step three, scribing off of the other reference face. – A sharp plane blade. It’s obvious, but it bears repeating. The blade will cut even when it’s not optimally sharp, but with decreasing efficiency. Which equates to more physical energy on your part (or my part, in this case). It’s not always obvious when it’s still cutting but could be sharper. I could tell more easily when taking a thin shaving. It also seemed to be more accurate with a sharp blade, I think because it will take a wispy shaving if necessary when sharp, but would leave material in that area when it started to dull. Does that make sense? – Wax on the sole of the plane. This makes a HUGE difference, way out of proportion to what I expected when I first tried it. I have a cake of beeswax and just give the bottom (of the plane) a rub now and then. – Check all of your references and adjust your planing strategy to remove material accordingly. I generally make 2 or 3 passes with my Stanley #8 to knock off the high spots, then stop and check with a straightedge and winding sticks (and square if it’s the second reference surface). If there is twist I try to account for that early. As opposed to planing it flat and smooth and then checking for twist, and then having to flatten it again. I try to balance it all so I do the minimum amount of planing. – Knots can throw off your planing. If I have any hard knots that stick up I’ll knock that area down with my low angle jack plane fitted with a toothed blade. It’s the best thing I’ve found for knocking down a knot. Once the surface is close, a sharp blade and light passes with the #8 will handle any knots just fine. – Find an efficient chip thickness. I try to take fairly aggressive shavings when I’m working to correct twist or cup (or whatever), but it’s a balance between the effort to push the plane for one pass versus making 10 light passes. Find what works for you. As I get closer I lighten up the cut, and on the last few passes I’m taking a pretty light shaving. 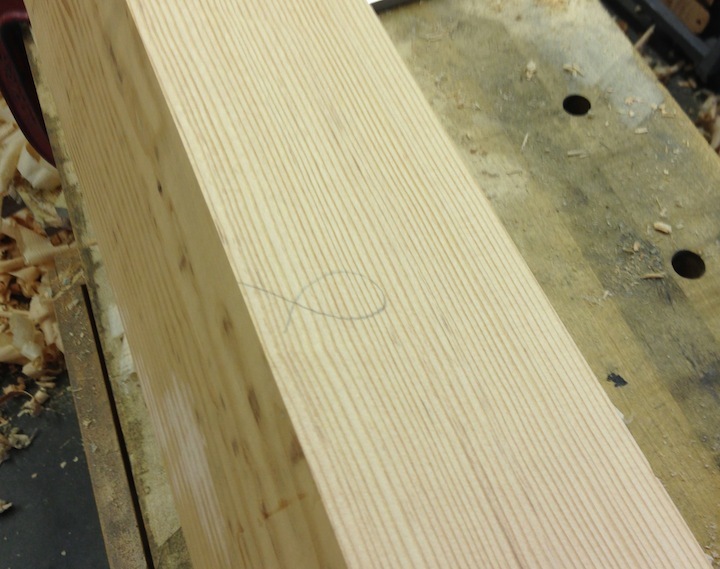 – Check for twist with winding sticks at the ends of the board, and then move one to the half way point and re-check. Sometimes the twist is localized to a smaller area of the board. Plane diagonally from high corner to high corner and re-check. I’ll make 3 or four passes corner-to-corner in the same track, than one one each side of the track. – Make sure the face is flat from side-to-side before you check for twist. Or, at least, that the winding sticks aren’t rocking on a high spot. I need to upgrade my panel gauge. This one has a pin and it’s really, really hard to use accurately. It wants to catch the grain and follow it, which of course is less than useful. I recently got a Hamilton marking gauge (it’s sweet!) and I think I’ll get his panel gauge too. It seems like a thumbnail-shaped knife would have less trouble cutting across the grain. I started back in on my Rouboish workbench today. Two legs are square on four sides, and I’m bushed. I must be doing something wrong because I never see Schwarz or Underhill sweating, at least not planing. Last weekend Kolya and I did some woodworking. He had an idea to make a “wrist blade”, which I believe is something inspired by the “Assassin’s Creed” video game. Generally, left to his own devices, playing video games would be his default activity. I asked him not to play any video games last weekend (long story) and he decided to spend his time making something in the shop. I’m so totally stoked. I worked with him for a while, then he kept going on his own for probably another 2 hours. He messed up a couple of parts, and had some successes. Generally, I count that as a pretty good day in the shop. He made a knife out of a scrap of Purplehart. 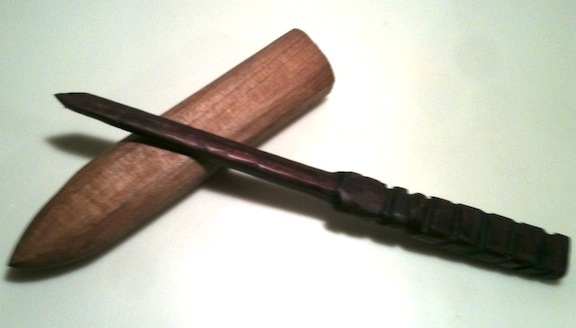 I especially like how he grooved the handle, it feels good in the hand. The sheath is Redwood. We hand planed the faces, used a gouge to carve a recess in one side and then glued it together. The shaping of the outside was done with just a block plane – he wanted to hit it on the belt sander, but I wanted him to leave it like this. I put a coat of oil on it for him, and it’s slowly drying. The knife fits the sheath really nicely, it slides in without any resistance, then the last inch is goes over a small hump and locks in place. That was sort of fortuitous, but we’ll take it. My son and I got back from WIA West last night, we had a great time. I think that some of the classes were too much for Kolya, but it’s a lot to expect a 12 year old to sit through through powerpoint slide presentations for an hour or two at a time. 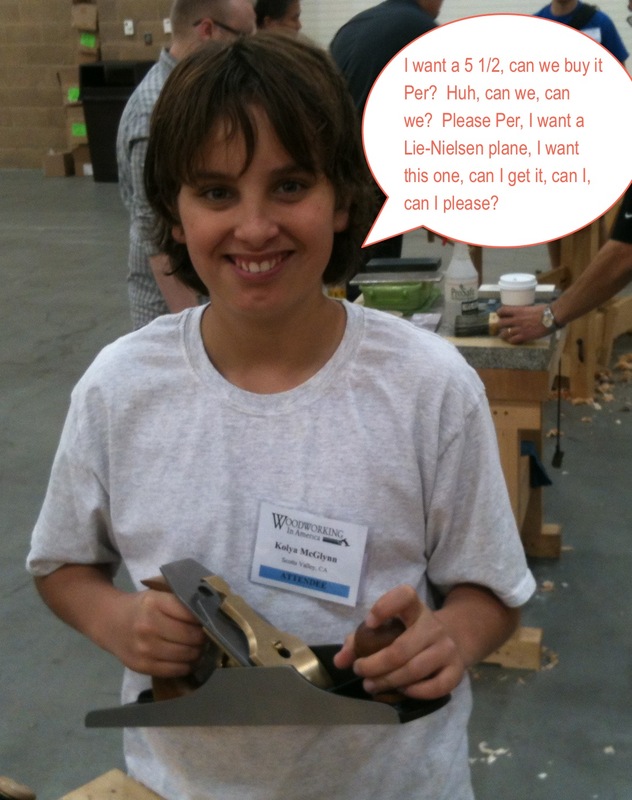 Take one high strung 12 year old, a display full of expensive tools, some caffeinated beverages and you get…consumer kid! 1. Gamble House Tour: The Gamble house is just amazing, whether you’re a fan of Greene & Greene or not, it’s an impressive piece of work. I happen to be a big fan, so this was a real treat for me. Kolya really liked it too. The docents took us through in groups of 10, and then we were able to wander through the house to our hearts content. No photography was allowed though (I don’t really get that, there were several details I would have liked to have a picture of). After the tour dinner was served on the lawn next to the Gamble house. The weather was perfect. 2. WIA Marketplace: Anyone who has read my blog has probably picked up on the fact that I love tools, almost as much as making things with tools. Don’t even get me started on making tools… I really enjoyed seeing the different vendors and talking to them about their products/services. 3. Lie-Nielsen Booth: Yes, I already listed the marketplace, but I need to have a special shout-0ut to the nice folks at LN. 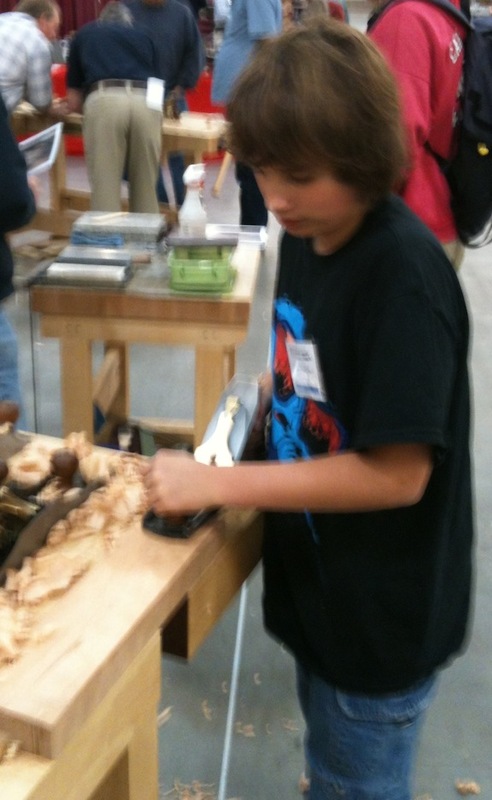 Kolya was just fascinated with their tools. He tried every plane they had, played with the spoke shaves, tried the chisels, and then went back and did it all again. The LN folks were unbelievable, they were very patient, and explained how to sharpen and adjust the planes, and what the differences were between the bevel-up and bevel-down planes. They do this with everyone of course, but Kolya spent a lot of time in their booth and got a lot of patient instruction. It made his weekend, and seeing that made mine too. In the end I bought him his own LN 5 1/2 which he decided was his favorite of the bunch. The smaller planes took more muscle to use, but the 5 1/2 has enough heft that he could do a nice job smoothing figured Maple with it by himself. 4. Roy Underhill: I went to two classes taught by Roy, one about making a wooden rake, and another about making a wooden sash. He is an engaging instructor, and even though I’d seen him cover the same material on his show I enjoyed this and learned a few new things. Kolya and I have watched Roy’s show online, and Kolya (who doesn’t have a shy bone in his body) saw Roy and went over and introduced himself and had a nice chat with Roy. Roy even gave him the story stick and pieces from the wooden sash project for him to finish at home (I’m looking for a sash plane on ebay as we speak). It absolutely warms my heart when folks include my son as just one of the guys. Later at the “Ribald Society of Old Moxionan’s” dinner Roy gave one person at every table a woodworking pun to read – and he choose Kolya to read from our table. This was followed by pelting with marshmallows, but that’s another story. 5. Classes in General: I got to several good classes during the show. 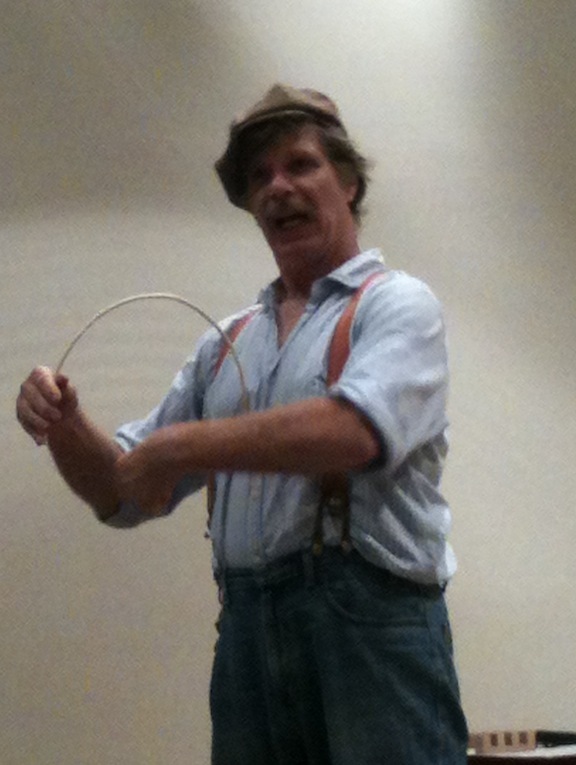 I enjoyed Chris Schwartz’ classes on the “60 minute saw bench” and “furniture of necessity”. Glen Huey’s “Finishes that Pop” was also very good, it was one of Kolya’s favorites — which was interesting in itself. I wish I could also go to WIA in Cincinnati in a few weeks, both for the conference itself, and to compare it with the west coast version. It felt like the west coast version wasn’t as well attended as I would have expected. The marketplace was missing a number of vendors that I really would have liked to see (that will be at the cincy event). I was really disappointed with the “Hand Tool Olympics”. I’d watched some online videos from previous events and it looked like it would be fun, and instructive. When I went to the HTO booth (4 different times) no one would talk to me or even make eye contact. It was like a high school clique, and no one was interested in engaging with conference attendees. There wasn’t any information on how to participate, how the events worked or anything. I’m for voting that one off the island. So I’m sitting in the San Jose airport with my son, waiting on our flight to Los Angeles for WIA. Which I just heard is delayed an hour. Seriously? It’s only an hour flight. Between traffic getting here, long term parking, waiting for the shuttle, waiting for the seat assignments, waiting for TSA and now waiting another hour for a delay I’m wondering if I should have just driven there instead. GRRRR! But I’ve put the time to good use futzing around on my iPhone. Futzing is the proper technical teerm, I work in high tech, I know. Trust me. 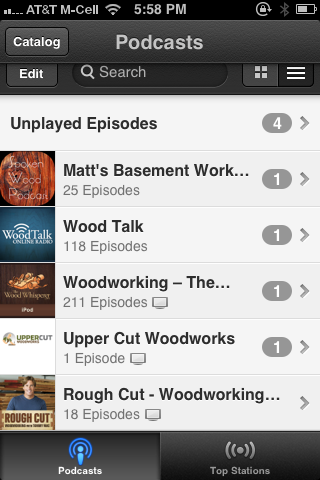 First, I used the podcast app to subscribe to a few woodworking podcasts. A couple that I watched were, well, not so hot. 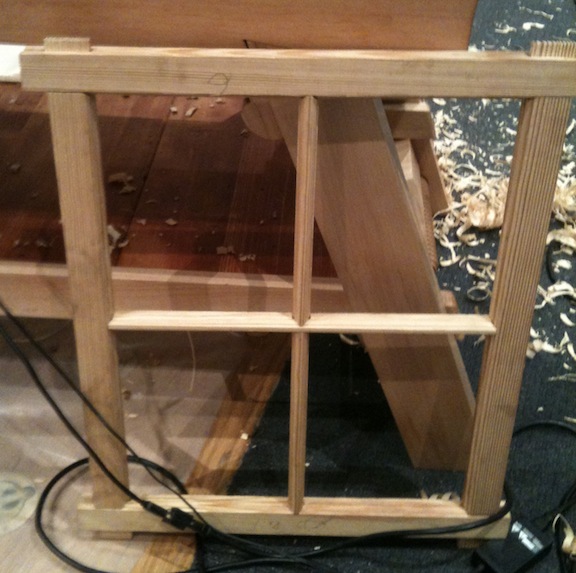 My favorite so far was a Wood Whisperer episode with William Ng talking about his joinery class. THAT looks like fun, I need to start saving my pennies so I can go to that. Then I took a look at the iBooks app. Guess what is available in the iBooks library for free? 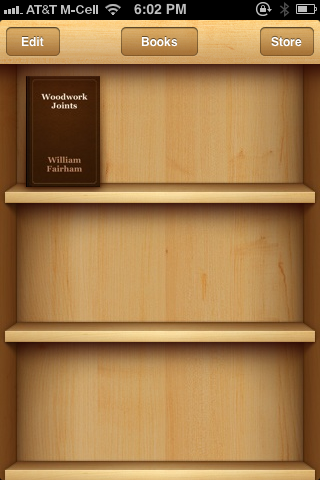 The William Fairham book on Joinery. (anyone see a trend yet?) I have a reprint of this book. It has some decent information, and the price is certainly right. But the real kicker was when I searched in the iTunesU app for woodworking courses. 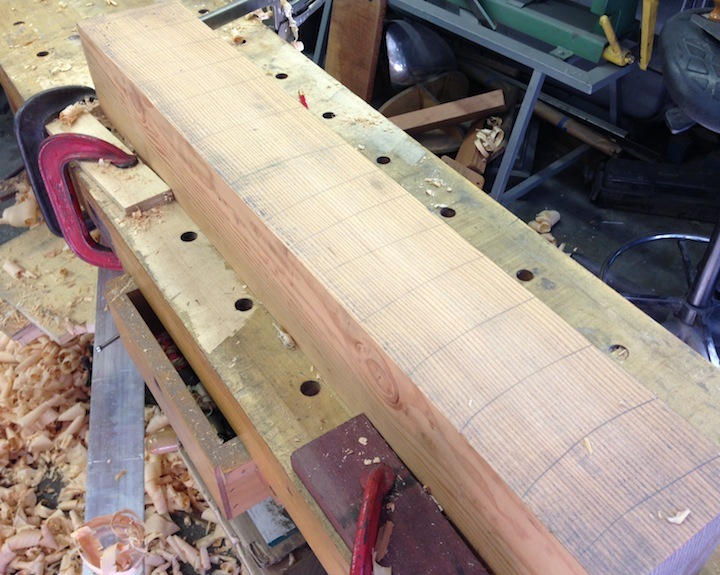 There are four short videos on how to layout and cut (by hand) four common joints. These are really nicely done, and again free for the downloading. 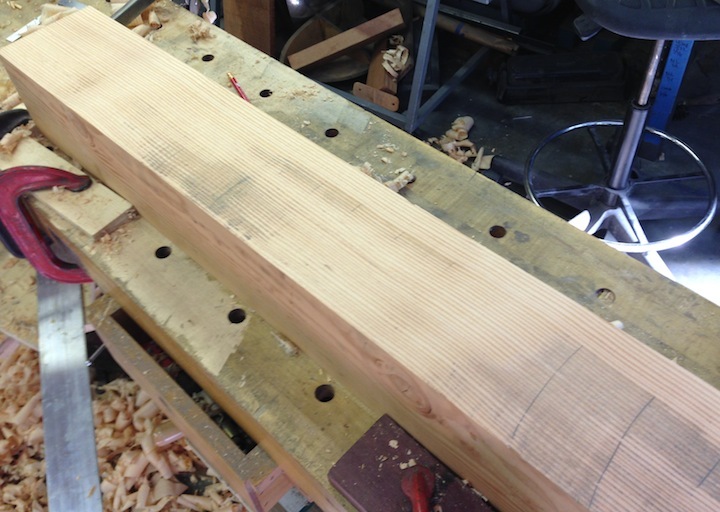 I picked up a cool tip in the first one I watched – the Mortise and Tenon video. Yes, I know it’s the last one in the series, I guess that says something about my approach to the subject matter. 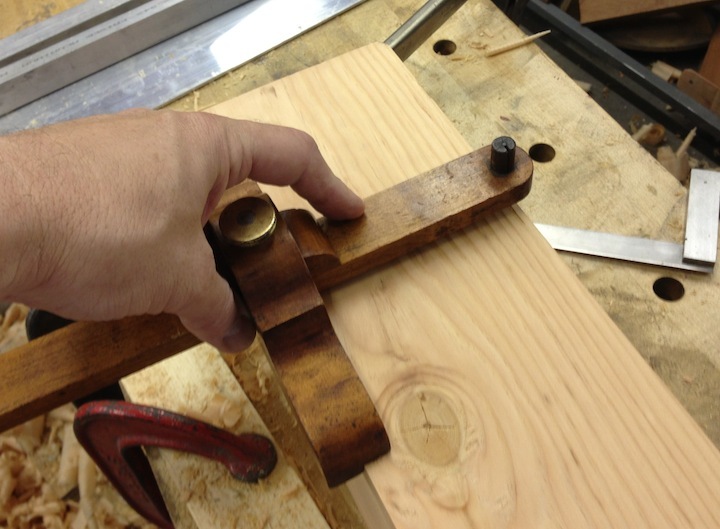 Here is the tip: when using a pin-type mortise gauge to mark out the sides of the mortise (or tenon), first press the pins into the wood at the end of the mortise or the baseline of the tenon. Then when you drag the pins to mark the layout they will stop in the indents you created and your won’t overshoot the layout. I have time to watch the other 2 videos before we board. And time to watch a short movie, and perhaps write a novel before we board. Not good. I took a couple of days off work so I could have some free time in the shop. Turns out it’s blisteringly hot this week. It’s usually pretty temperate here in the Santa Cruz mountains, and even in the depths of summer it still is cool in the morning and evening. This weeK Not so much. It 100 degrees outside, and HUMID. Like midwest-style humid. I made some simple “keepers” for the saw chest I started a million years ago. 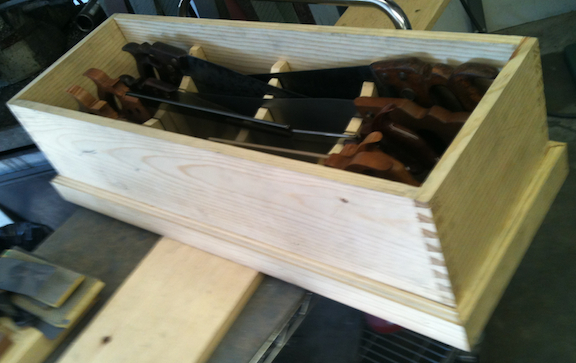 They aren’t fancy or even particularly nicely done, but now I can put my saws safely away. I expect with a lid and a coat of paint this will look OK. By the way, “keepers” is a fancy word for “scraps with slots”. I’m torn between doing a proper top using frame and panel construction, or just a slab of pine. I expect a lot will depend on the temperature tomorrow.